When my kids were little my friend Sarah made my family a big batch of homemade applesauce. I was dumbfounded. It never occurred to me the you could make applesauce. My kids adored it and it seemed I could never make enough. My biggest hurdle was peeling all the apples. So I got smart and bought everyone their very own apple peeler. I'd make a big batch with about 20 apples and get everybody around the counter, some standing on chairs so they could reach, and we all peeled apples. So thank you Sarah for introducing the Pawell's to homemade applesauce. The nice thing about making applesauce is it is so simple. 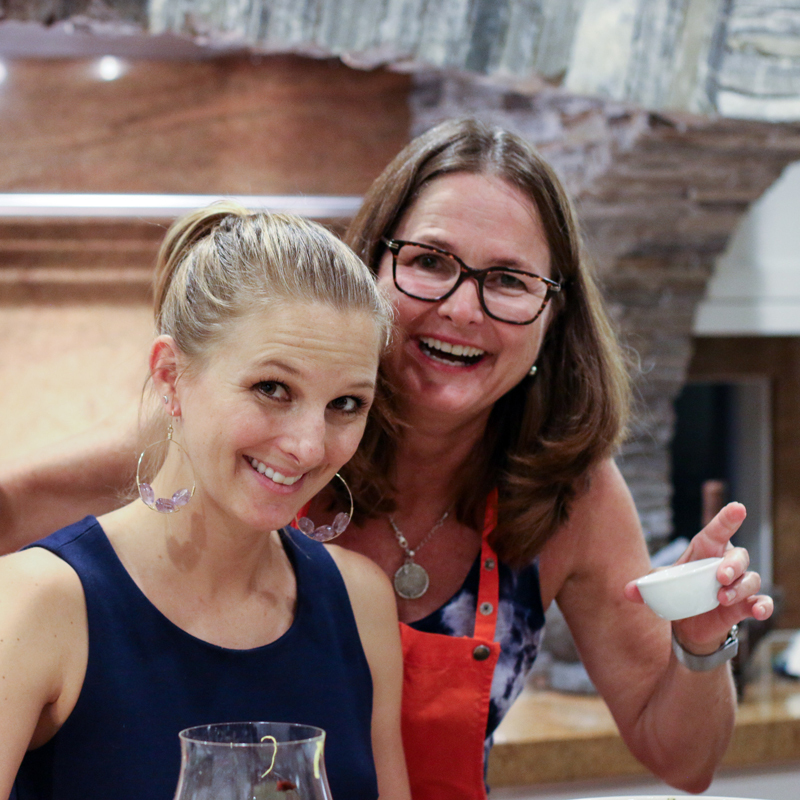 It is a perfect dish to introduce kids to cooking. I tend to use Granny Smith apples because I like that apple pie tartness that you get with green apples. You can use any apple you want. I like to put a little sweetener in my applesauce, but depending on the tartness of the apple it is not always needed. You can use maple syrup, honey, regular sugar, brown sugar or palm sugar. I avoid any artificial sweeteners just because. Sarah taught me to but a big pat of butter in the applesauce to finish it off. Warm apple sauce is delicious with a little butter, but I don't like to eat cold applesauce with butter in it. So in general, I do not use butter unless I'm feeling particularly flamboyant. 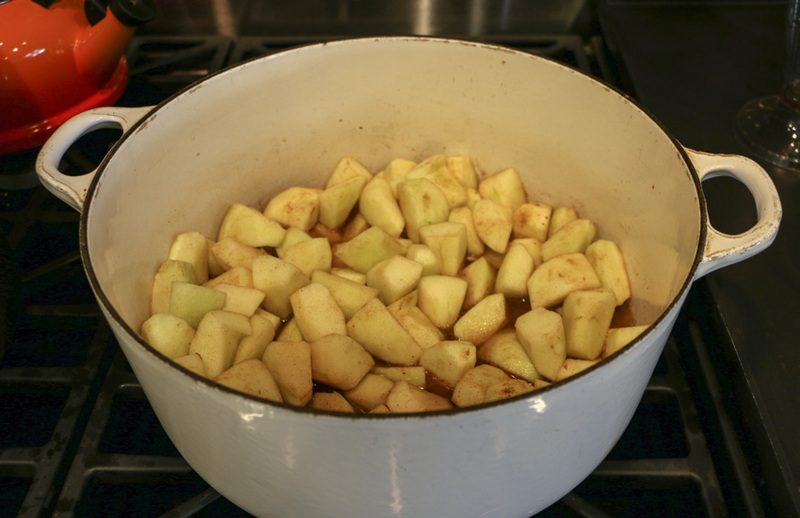 A large heavy bottomed pot is perfect for making applesauce. I like to use my Le Creuset Dutch oven. You will need a carrot peeler, or multiple peelers if you are enlisting your kids to help you. For me the most important piece of equipment, particularly if you are making a large batch, is an apple slicer and corer like this one. It doesn't quite get all the core, but it greatly simplifies the process by coring and slicing in one quick stroke. Then you can clean up any residual core or peel with a paring knife. Homemade apple sauce is so versatile. We eat it for breakfast with oatmeal or yogurt or sometimes with both oatmeal and yogurt. Applesauce quickly disappears when someone is hunting in the fridge for a snack. When my kids were little I packed it in their lunch. 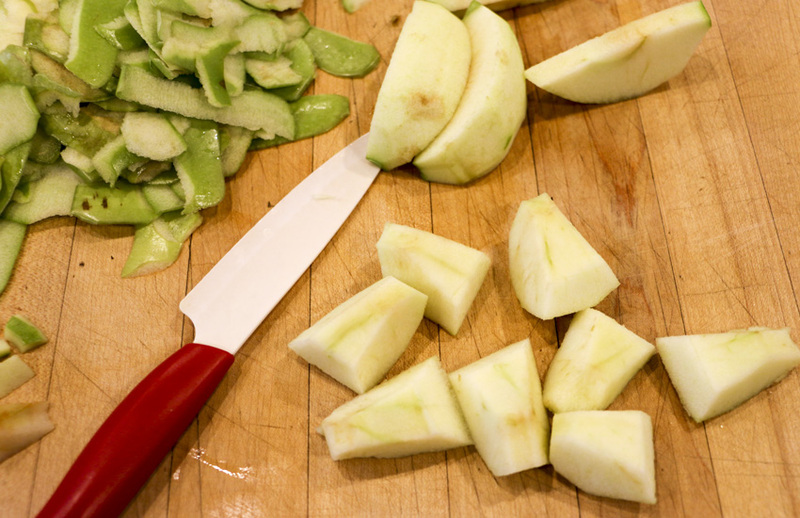 We eat applesauce as a side for dinner, or save it up for dessert. Try warm applesauce with Maple-brined pork chops. 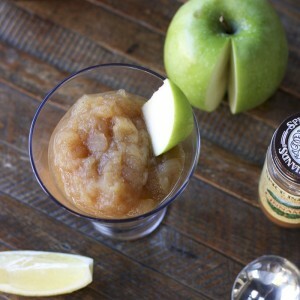 Apple sauce is delicious cold when the weather is hot and comforting eaten warm when the weather is cold. My single bit of advice is to double the recipe. You won't be sorry! 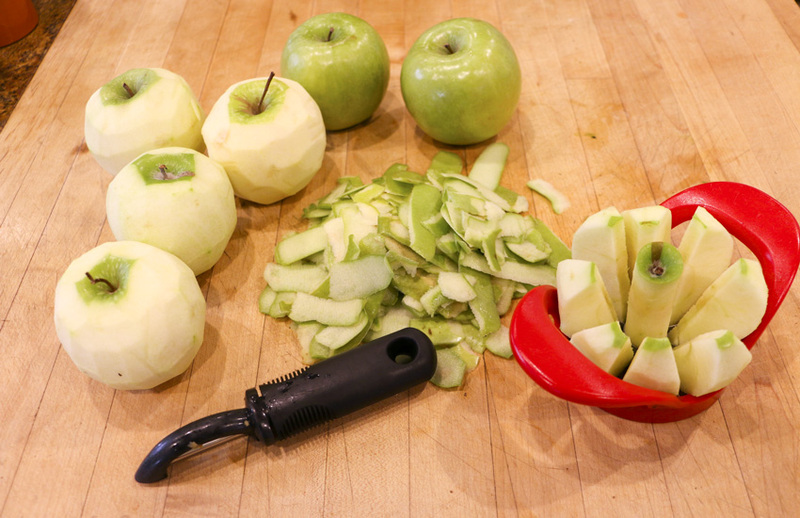 Peel all of your apples, core them, slice them and cut each slice in half. It is important that you remove all the core and peel or you will have hard bits in your applesauce. 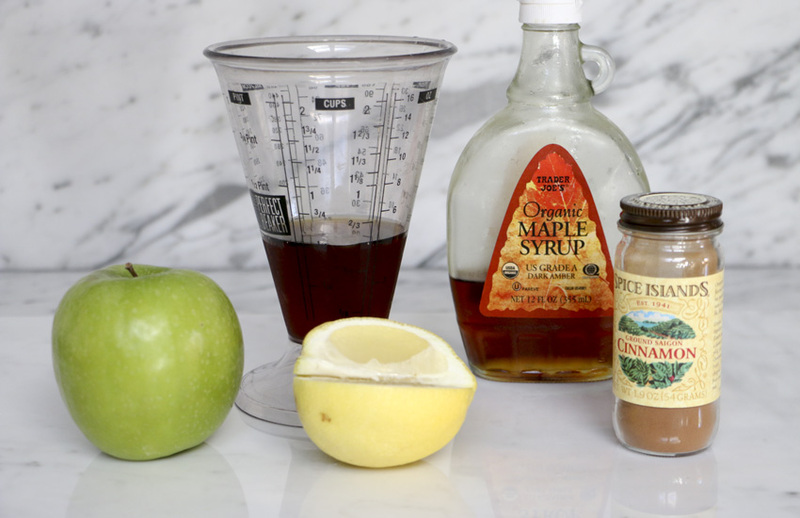 Put all the apple pieces in a pot, along with water, maple syrup, cinnamon and lemon juice. Bring to a boil, reduce heat to medium and cover. 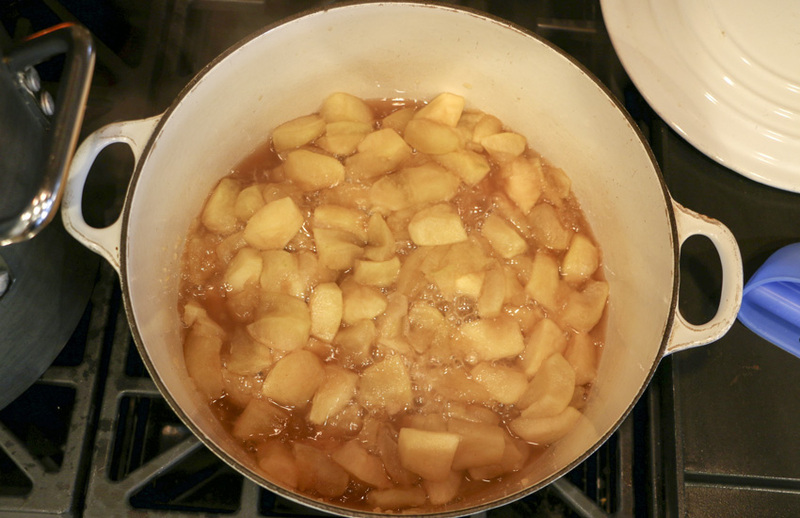 Cook for about 20 minutes, until apples are soft, stirring occasionally. 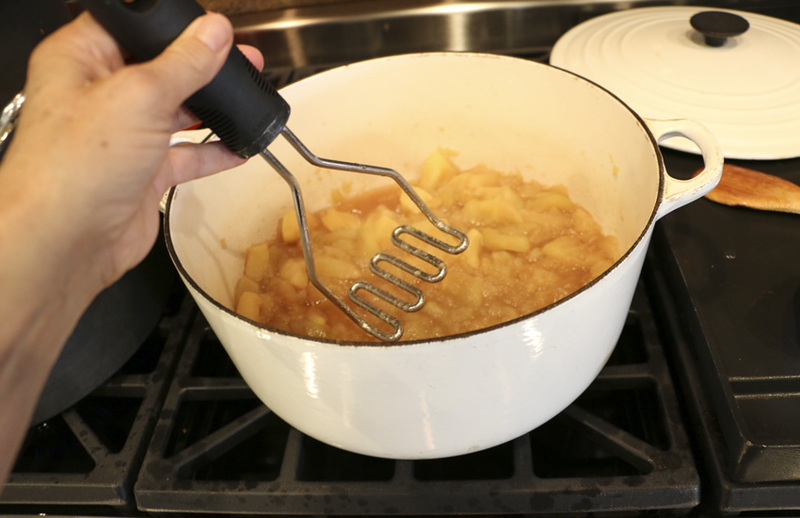 When apples are tender enough to easily smash turn off heat heat and go at the pot with a potato masher. If you don't have a potato masher you can use a fork. Mash until you get the consistency you like. I tend to like my applesauce chunky. 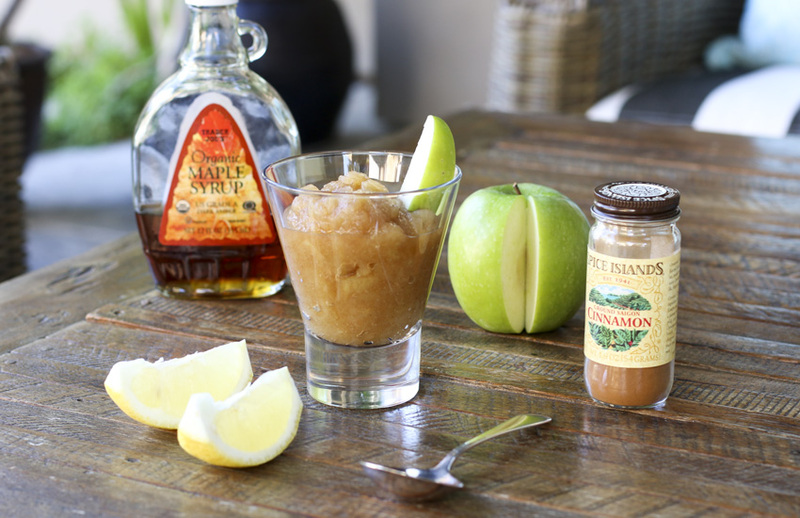 If you prefer smoother applesauce you can puree it in a food processor, blender or with an immersion blender. I have always been really lazy and bought my apple sauce from the store – but if it is this easy and delicious to make I definitely will be making the recipe. Thanks for the inspiration! You won’t be disappointed Thalia. 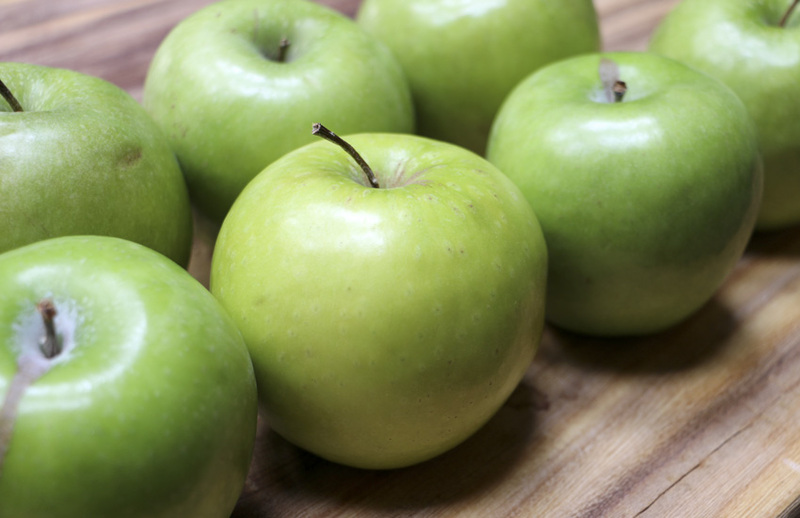 I am sure you will devise some interesting variations for apple sauce. Please share what you come up with. And once again, your photographs at Butter and Brioche are stunning! made it today using green apples and a little maple syrup. Cooked a little longer than 20 min to get the apples softer. Thanks for writing in Annie. Cooking time will vary a bit depending on the particular apples you are using, the pan you are cooking them in, the heat source and personal preference. Your comment was a good reminder to always taste and never strictly go by recipe times. Thank you!